Hanna-Leena Paloposki, chief curator and archive- and library manager at the Finnish National Gallery, presents a selection from the gallery’s collection of Daniel Nyblin glass negatives, a collection comprised of the photographer’s lesser known images of artworks. Daniel Nyblin (1856–1923) was one of the leading and most productive photographers in Finland during the turn of the nineteenth century. Known for his portraits, tens of thousands of his cartes-de-visite and larger cabinet portraits have survived, partly in the collection of the National Board of Antiquities in Finland. Nyblin was particularly popular as a photographer among the middle and upper classes of Helsinki, and his studio and name were well known in the city. In addition to portraits, his photographic oeuvre comprised of landscapes and townscapes. Nyblin, however, is less known for his photography of artworks, and it is such pictures of which The Nyblin collection, owned by the Finnish National Gallery, consists. Nyblin trained as a photographer in his native country of Norway and became acquainted with both photography and visual arts during a study trip in the United States. In 1875, at the age of 19, he arrived in Helsinki and made it his home. At that time, Finland belonged to Russia as an autonomous Grand Duchy, from 1809 to 1917. It is unknown why Nyblin remained in the city as his intention might have been to travel to Saint Petersburg, the capital of the Russian Empire, where the opportunities and market for a competent photographer would have been considerable. The photography business was experiencing a boom throughout the second half of the nineteenth century, accelerated by new technical advances. 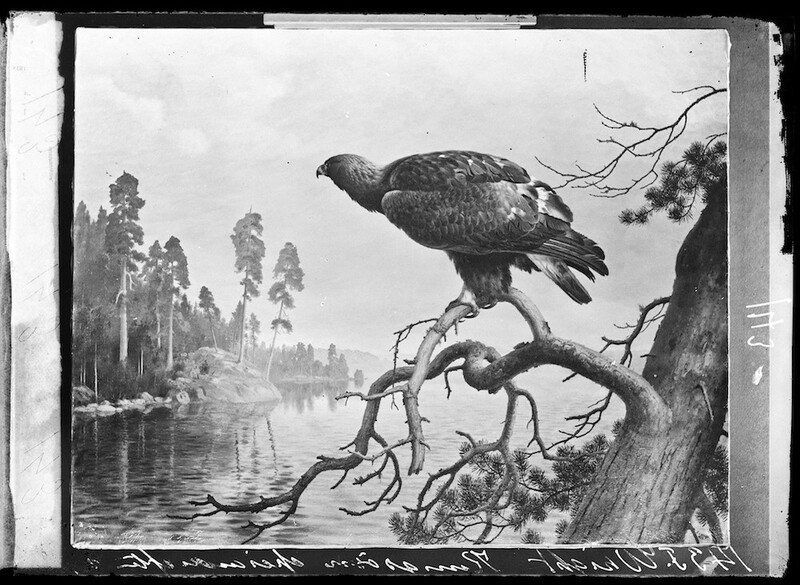 Ferdinand von Wright, Eagle, 1877, oil on canvas, owner unknown. 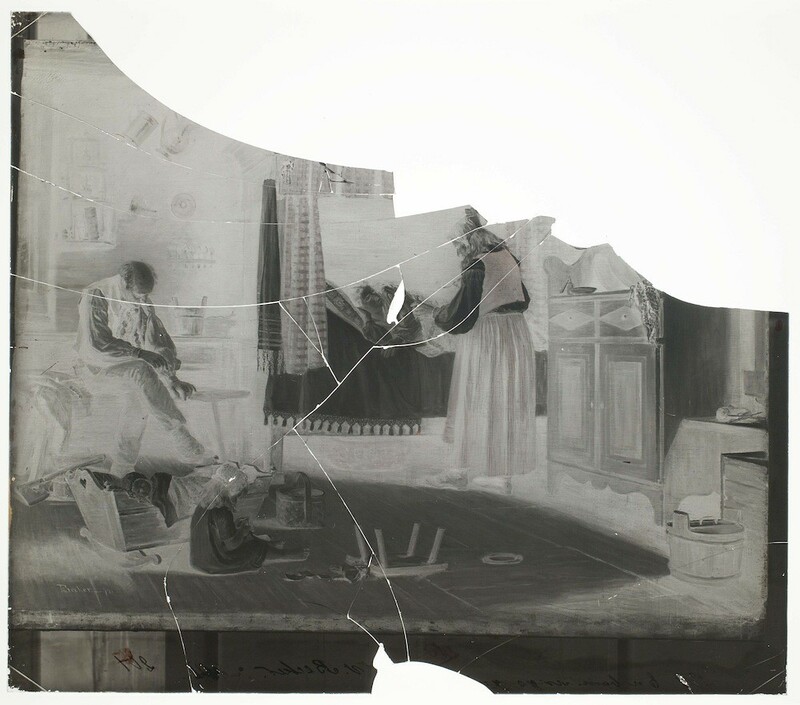 Glass negative (and positive), wet collodion plate, 391 x 327 mm, Daniel Nyblin ca. 1879. Already by 1877, Nyblin founded his own studio in Helsinki and began photographing artworks two years later. He photographed twelve paintings at the annual exhibition of the Finnish Art Society and made the pictures into an album which was sold to the public. His partner in publishing, G. W. Edlund, was one of Finland’s major publishers and booksellers of the time. The album was a success and Nyblin later published others of a similar nature. 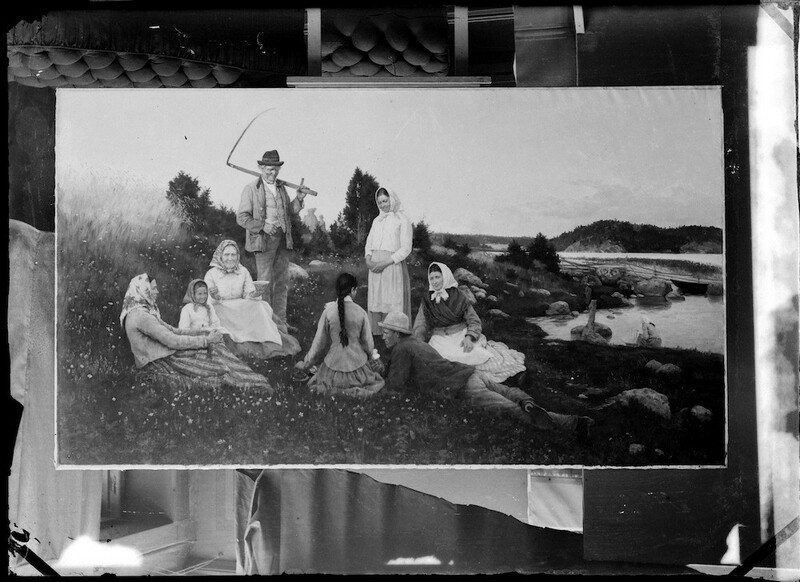 In 1883, Nyblin began to take photographs for a grand-scale picture series titled Finsk Konst – Suomen Taide (Finnish Art). He augmented this series every year with new photos, for example from art exhibitions, and at the beginning of the 20th century it consisted of 526 photos of artworks from 67 different artists. Nyblin and Edlund continued their partnership in publishing the series, and with Edlund’s connections to bookshops all over the country Nyblin’s photographs had a vast and comprehensive distribution network. The two gentlemen combined their skills and created a successful concept, although Nyblin was by his own right an able businessman and marketer of his own products. Albert Edelfelt, Summer evening, 1883, oil on canvas, owner unknown. 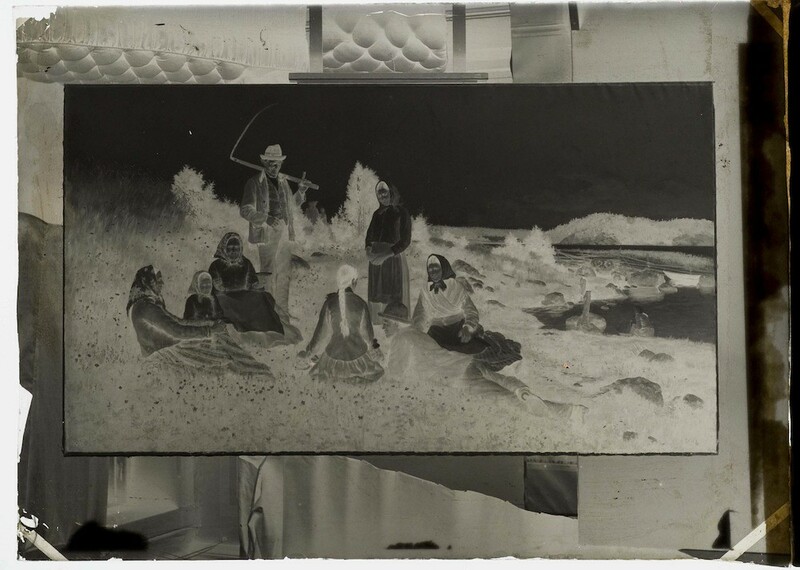 Glass negative (and positive), dry plate, 385 x 335 mm, Daniel Nyblin ca. 1883. Daniel Nyblin included sculpture in his Finnish Art Series. Walter Runeberg, Amor and Psyche as Children, this marble version from 1881, Ateneum Art Museum. 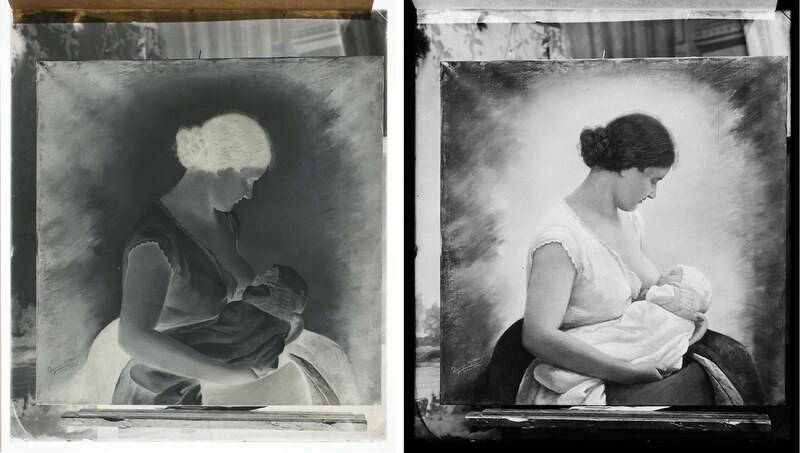 Glass negative (and positive), dry plate, 180 x 231 mm, Daniel Nyblin ca. 1883. The pictures of the Finnish Art Series were sold in various sizes as prints mounted on cardboard. Nyblin also started printing photographs in formats suitable for hanging them on walls, and so making them echo the paintings they so often captured, a practice which helped to establish photographs as interior decor. In 1882, Nyblin adapted a new technique by changing the wet collodion plates into new dry plates that were more handy and quick to use. From 1889 onwards, Nyblin published a printed catalogue of his photographs. Similar to a mail order catalogue or an online store of that time, it included samples of each picture on sale and information about the different sizes available. Daniel Nyblin took an interest in painting and had also studied art at a younger age. The Nyblin collection at the Finnish National Gallery includes a picture of one his pastels, Madonna and Child (1899). Nyblin mainly photographed the contemporary art of his day and often took the pictures when the artworks were newly-completed or first exhibited. As art exhibitions and museums were largely concentrated in Helsinki and a few other towns, the prints made it possible for those living in the rural areas to familiarise themselves with new Finnish art. It also made the artworks displayed in the capital almost simultaneously within the reach of the potential buyers in other parts of the country. Through his photography, Nyblin’s role in spreading the knowledge of Finnish art at the turn of the nineteenth century became significant. The photographs disseminated the image of Finland and Finnish culture while also acting as a link in the awakening of the national consciousness and idea of Finnishness during the autonomous period under Russia. Albert Edelfelt, After the Bath (In the Nursery), 1885, oil on canvas. The State Hermitage Museum. Saint Petersburg. 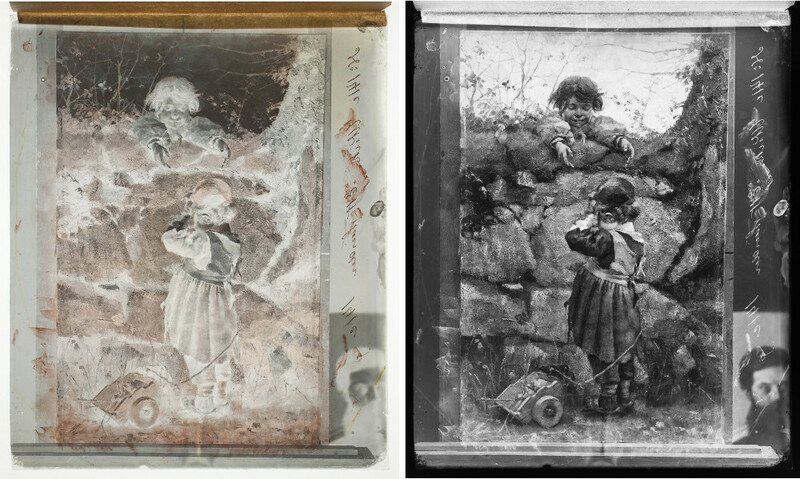 Glass negative (and positive), dry plate, 390 x 340 mm, Daniel Nyblin ca. 1885. The painting was ordered by Alexander III, the emperor of Russia. Nyblin’s relationships with Finnish artists were good. For them, the photographing of their art and spreading of the prints meant extra income and visibility. Nyblin also took into account the rights of the artists and the first copyright law in Finland came into effect in 1881. Nyblin usually photographed the artworks at his own studio despite the connections to the exhibitions they might have had. 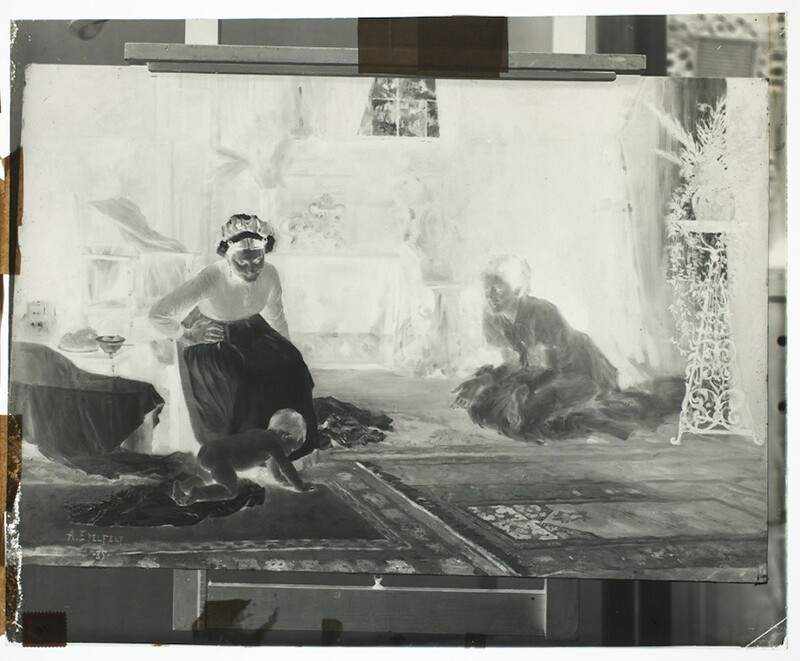 This can be seen in the glass negatives where a large houseplant or a piece of furniture of the studio is visible behind the frames of a painting. See for example Fredrik Ahlstedt, Break during the Harvest, 1884, oil on canvas, Ateneum Art Museum. 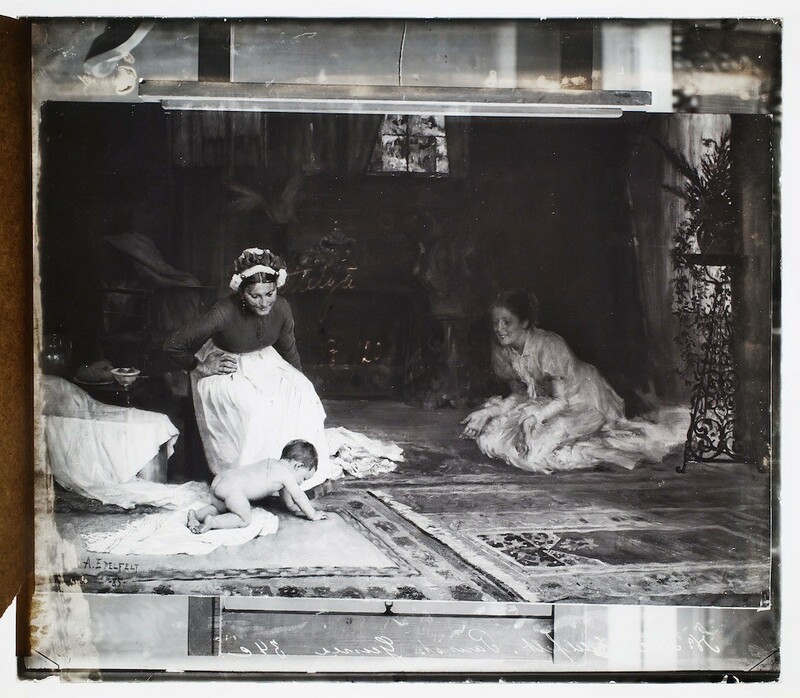 Glass negative (and positive), dry plate, 165 x 119 mm, Daniel Nyblin ca. 1885. You can see a couch in the background. Nyblin himself saw his work as making a photographic replica of the original artwork. He marked the prints with a text “photograph of the original by Daniel Nyblin, Helsinki”. On the glass plates he usually wrote the name of the artist or of the work of art or both. The documentary value of the negatives has increased during the decades. Many of them are the first or oldest surviving pictures of the artworks in question. Owing to Nyblin’s activity there are also pictures of artworks that have later gone missing or been destroyed. Maria Wiik, Obstacle, 1884, oil on canvas, whereabouts unknown. Glass negative, wet collodion plate, 326 x 392 mm, Daniel Nyblin ca. 1884. The painting was sold to Russia in 1896 from an exhibition in Nizhny Novgorod and its later whereabouts are unknown. 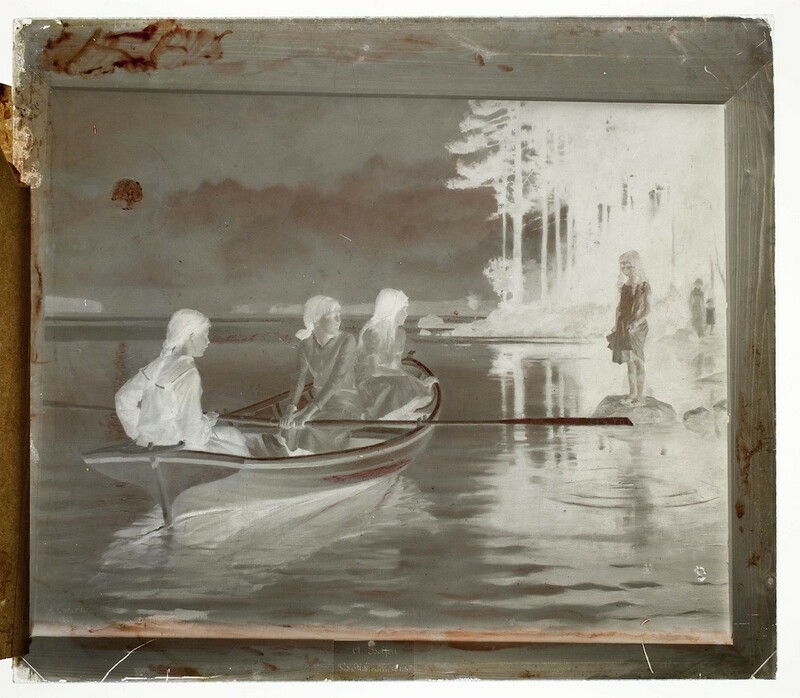 In some cases, the photographs taken by Nyblin enable us to see the first or original version of a painting before the artist altered it in one way or another. An example of this is the painting nowadays known as A Day in July (1891) painted by the well-known Finnish artist Eero Järnefelt (1863–1937). 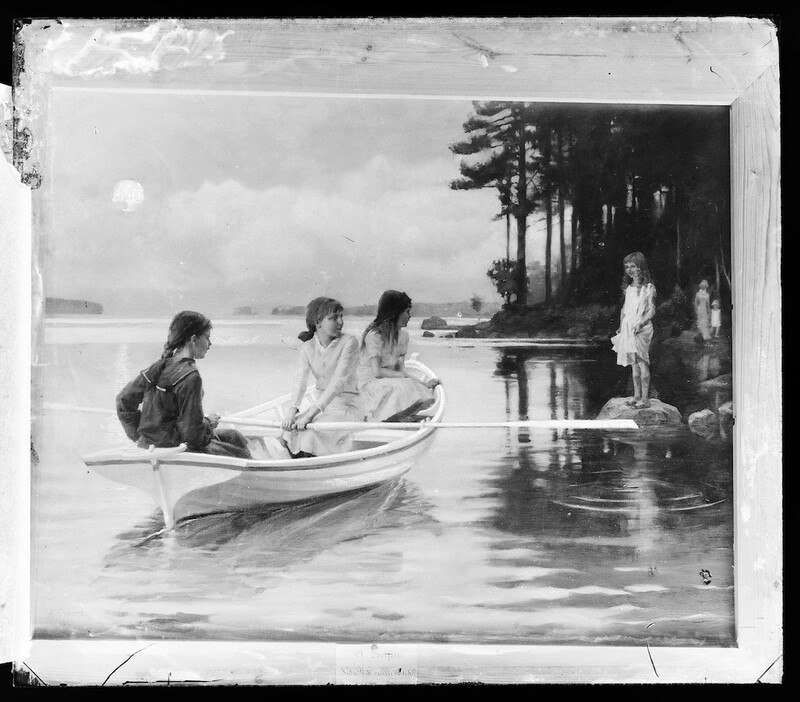 In the painting, now owned by the Hämeenlinna Art Museum, the second person, a girl, does not appear, though she is visible on the glass negative. Järnefelt later painted over her with only the boy remaining in the painting. Eero Järnefelt, A Day in July, 1891, also formerly known as Slash-Burning, oil on canvas. Hämeenlinna Art Museum. Glass negative (and positive), dry plate 121 x 165 mm, Daniel Nyblin ca. 1891. The most recent plates of the artworks date from 1904. The following year, in 1905, Nyblin divided his enterprise into two different corporations and divested one half to his children. These changes following the death of his wife in 1904 may have been the reason he stopped photographing artworks. It was probably during the same year that he and Edlund sold the negatives to the Finnish publishing house Werner Söderström (in Porvoo) who kept them for 80 years. In 1983, they were donated to the museum, nowadays the Finnish National Gallery. Magnus Enckell, The Lovers, ca. 1904, oil on canvas, owner unknown. Glass negative, dry plate, 389 x 277 mm, Daniel Nyblin ca. 1904. 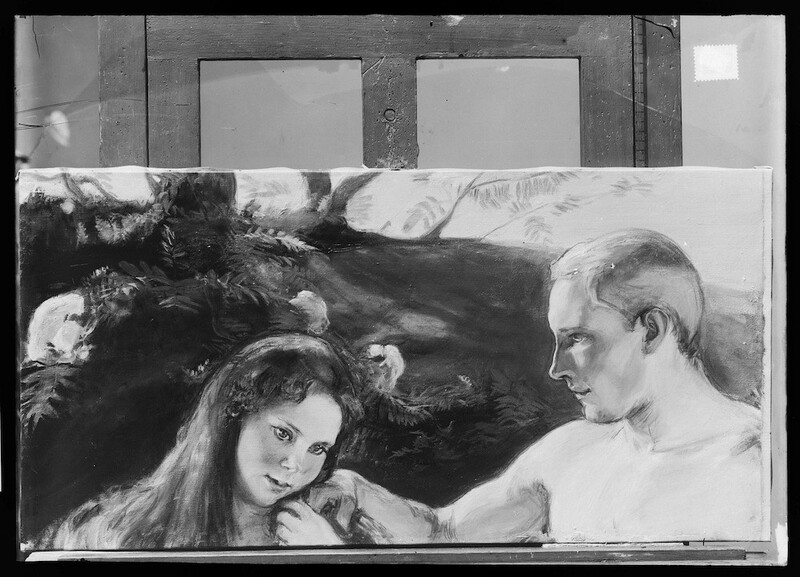 There are 963 glass negatives in the Nyblin collection at the Finnish National Gallery with multiple plates of some of the artworks. 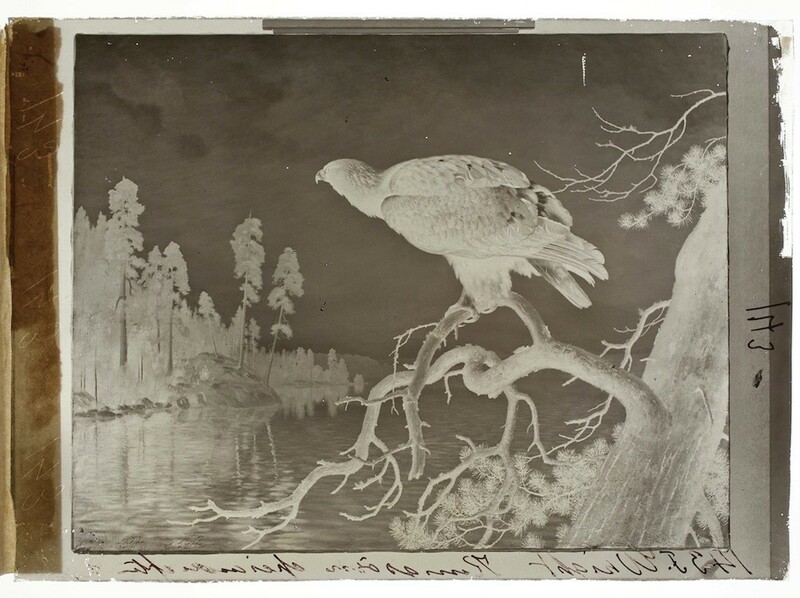 A selection of the pictures were shown in the exhibition Reflections in Glass – Daniel Nyblin, Photographer of Artworks in 19th Century Finland at the Ateneum Art Museum in 1999, with a book published under the same name. All the glass plates were photographed and the positives were made digitally at the Finnish National Gallery between 2009–2012. The process was extremely slow and demanded special expertise as some of the plates had been broken during the decades. 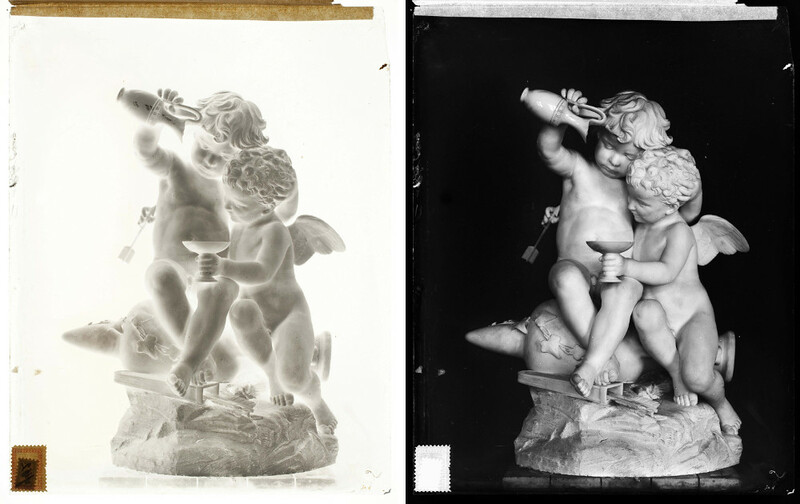 At the Finnish National Gallery, the negatives themselves were treated as objects. It is because of this that every plate was photographed in its entirety with all the markings on the margins and the broken plates remaining unrepaired in the pictures. 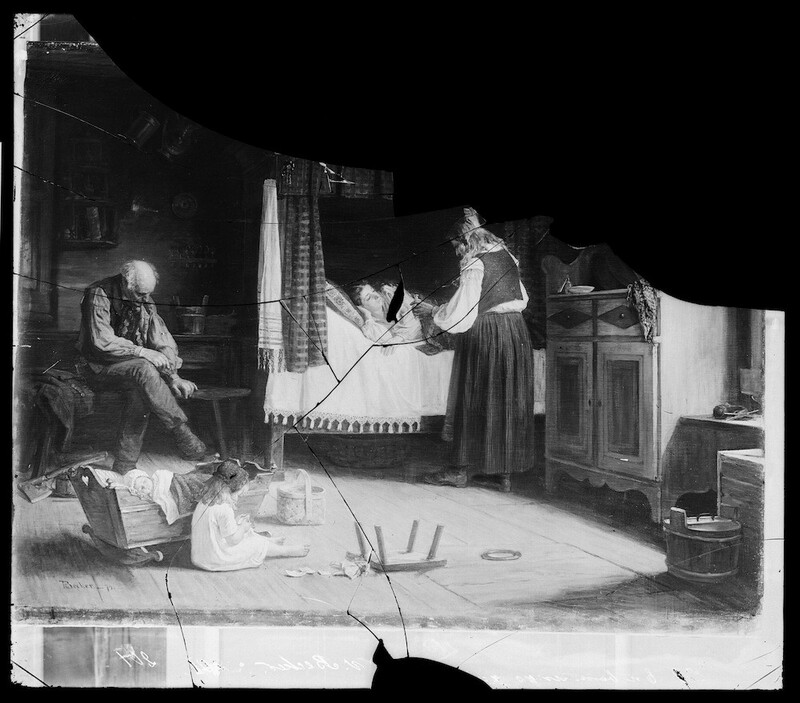 An example of a broken negative: Adolf von Becker, Young mother, 1874, oil, owner unknown. 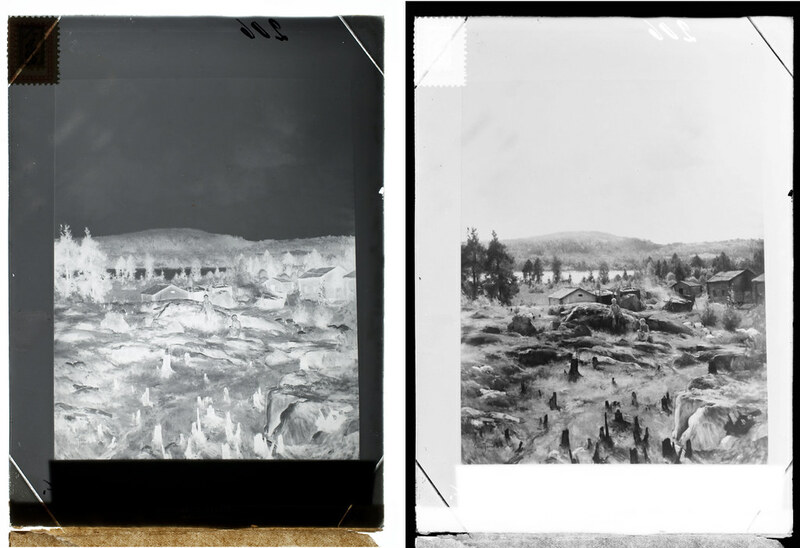 Glass negative (and positive), dry plate 392 x 341 mm, Daniel Nyblin ca. 1890. The handprint of Nyblin still stands out to us through the finishing touches of different versions and colours that Nyblin made before printing – as well as through his fingerprints. Akseli Gallen-Kallela, Mother by the bed of her sick child, 1888. Private collection. 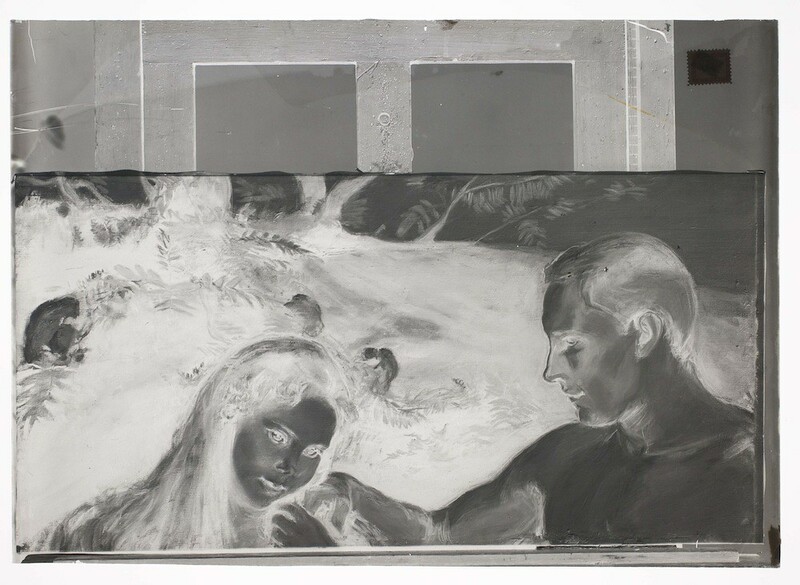 Glass negative (and positive), dry plate, 119 x 164 mm, Daniel Nyblin ca. 1888. The red finishing touch can clearly be seen on the negative. 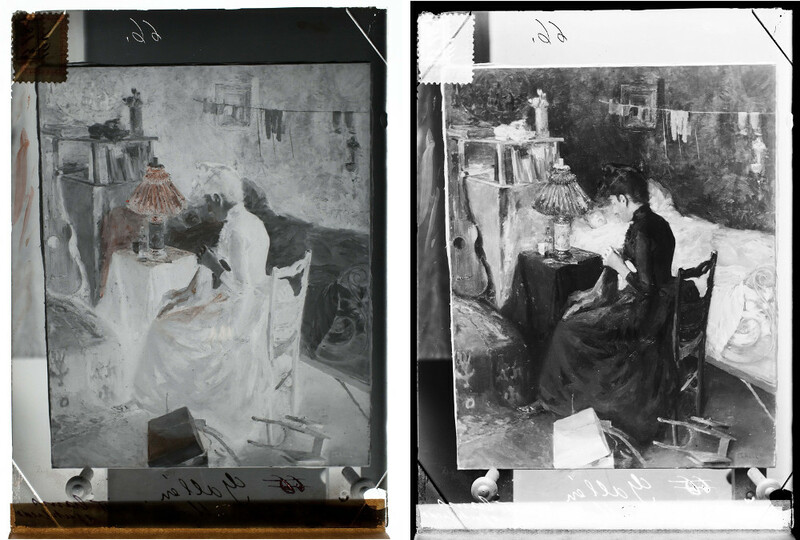 The digital pictures of Nyblin’s glass negatives (and positives) and their metadata were published as open data by the Finnish National Gallery in autumn 2012 in connection with the Open Knowledge Festival organised in Helsinki. The pictures will be available on Flickr later this year. There is also a special web site on the collection (http://www.lahteilla.fi/nyblin/, only in Finnish). The copyrights of some of the artists represented in the Nyblin collection are still effective and therefore some of the plates have not been published. The pictures will be added both as an open data and to the website as the copyrights of the artworks expire. Hanna-Leena Paloposki works as the chief curator and archive- and library manager at the Finnish National Gallery in Helsinki. She has a PhD in art history from the University of Helsinki. See more images from the Finnish National Gallery’s Daniel Nyblin collection here, and download them all here.